Here's yet another example of "deceptive memory". The first time I saw Amazon Women on the Moon, which has to be over 20 years ago, I thought it was one of the funniest movies I'd ever seen. Revisiting it all these years later, I still found quite a bit of it funny, but was surprised by how many of the gags fall flat, and in a big way. With five different directors at the helm, including the likes of John Landis and Joe Dante, Amazon Women on the Moon presents a series of short skits that center on the problems a late-night TV station is having with their broadcast of a cheesy sci-fi film. As the technical difficulties mount, the station breaks away to a variety of commercials, public service announcements, and coming attractions, all designed to tickle your funny bone. 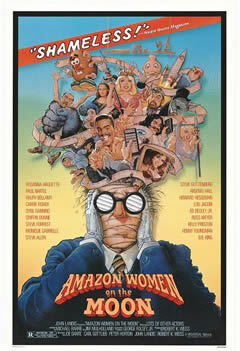 I still laughed as I watched Amazon Women on the Moon. Lou Jacobi, playing a frustrated husband who ends up trapped in his television set, is hilarious, and I had a blast whenever the movie cut back to the 'feature film', a send-up of 50's sci-fi fare. But a number of sketches are real clunkers. There's a hospital skit with Michelle Pfieffer and Griffin Dunne that's downright painful to sit through, as is a black-and-white segment with Ed Begley Jr., playing the son of the Invisible Man, which stretches on well after its single joke has already been beaten into the ground. By no means is Amazon Women on the Moon a waste of time. Overall, I'd say there are more laughs than groans. Fair warning, though: be prepared to sit through a few duds along the way! @Gregamortis: Thank you, sir! Always nice to hear from my podcasting brethren. Glad you enjoyed it, and I'll talk to you soon. All I need is the Arsenio Hall segment, where everything goes wrong in his apartment. I howl every time. The bit with the VCR tape is priceless.